Rent a beach basket before your holiday starts! Summer, sun and beach! What more do you want? Using the railway you arrive on the North Sea Sylt in Westerland, and directly seize this certain Sylt feeling. 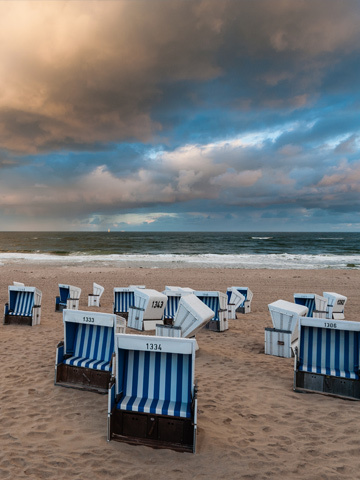 The Weststrand stretches forty kilometers and offers holidaymakers, on island of Sylt, enough space for a relaxing beach walk, or a sunny beach day. A symbol of a relaxed day at the beach are the 12,000 Sylter beach baskets. They defy the wind and serve as a shadow giver in bright sunshine. 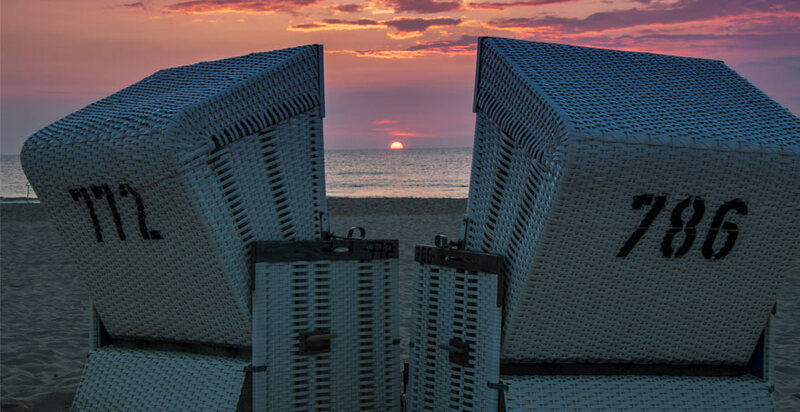 Plan your holiday on Sylt and book a beach basket! It is very easy to do it online, before arrival and enjoy the holiday stress-free. There are days on which you can not find any free beach baskets, if you didn’t book it in advance. Another advantage of the online booking of beach baskets is that you can directly get an overview of available beach baskets even before your North Sea vacation. So, you can determine at which beach section you want to spend the beach day on the island of Sylt. You can also see where the next toilet or the protective rescue float is located. Or discover gastronomic offers near your beach basket! Especially on a nice family day at the beach, with children, the online reservation of beach baskets, before the beginning of holidays is a great advantage. Children can quickly get a delicious ice cream and have fun in surroundings. From Westerland to Rantum, you can secure your place in the sun. With the help of an interactive map, you can book the beach basket that fits your holiday planning and your preferences, not the other way around! Secure beach basket online booking! With the help of the Onlinetool, you can book a beach basket on Sylt, via Internet, not just easily, but also safely. The island tourism service offers holidaymakers of the North Sea Sylt a practical possibility of relaxing in the beach basket, in the hotel, as fast as possible. Make sure you have the most beautiful place on the beach even before the start of your holiday. As a dog owner, you do not want to stay without your dog in the most beautiful time of the year. The extensive beaches are not pure relaxation just for people! Your four-legged friend can also enjoy a busy day at the beach. On Sylt, dog owners will be able to find 17 dog stables in which your dog can play. Also in Westerland and Rantum there are enough dog restaurants. With the help of online booking, you can reserve your beach basket at the dog beach and enjoy the Sylt holiday in the beach basket with your dog. … most Sylt holidaymakers enjoy in the Summer, Spring and Autumn. But, if it gets colder in the winter and the number of visitors reduces, then also the beach baskets rental is on pause. Then the approximately 12,000 beach baskets are transported, by tractor, to the winter storage. In winter storage, the Sylter beach baskets receive the deserved “wellness treatment”. In everyday use on the Sylter beaches, they are exposed to wind and weather. To ensure that the comfort of the seats is not affected by the damage caused by the holidaymakers, screws are replaced, damaged materials are repaired and defective components replaced. Every year hundreds of beach baskets are patterned and replaced by new beach baskets. After approximately 10 years of service the Sylter “furniture pieces” go into the deserved retirement. But then there is not a long way to go! 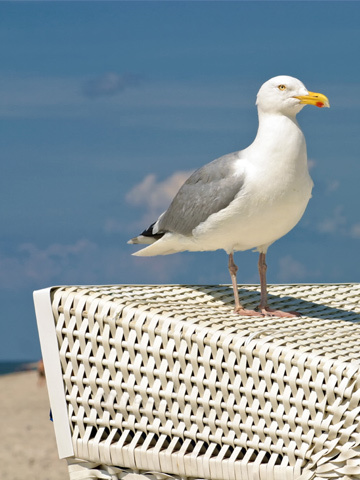 The comfortable beach furniture is increasingly popular among Sylt visitors. As a comfortable sun protection with sufficient storage space, the beach baskets on the German home-breeders experience a second spring.